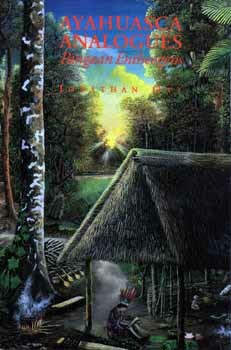 Ayahuasca Analogues is the first book to explore in detail the human pharmacology of ayahuasca, fabled jungle ambrosia. After reviewing carefully the ethnobotanical, chemical and pharmacognostical literature on the Amazonian Amrta, Ott describes more than three dozen psychonautic experiments designed to elucidate the incredible pharmacology of ayahuasca potions, ingenious amalgamations of extracts of the ayahuasca liana, depicted above, which contain enzyme inhibitors, and extracts of leaves of other plants containing DMT (like Psychotria viridis, depicted below), a potent entheogen ordinarily inactive orally. Ott boldly characterizes the discovery of ayahuasca potions by various groups of South American Indians as "one of the most sophisticated pharmacognostical discoveries of all antiquity." There follows a review of the literature on the plants containing ayahuasca-type enzyme inhibitors, and on plants which contain DMT and related entheogenic tryptamines. The resulting tables of more than 60 plants in each category document Ott's contention that there are at least four thousand possible combinations of plants which can yield entheogenic potions like ayahuasca. These are the Ayahuasca Analogues of the book's title, and Ott's psychonautic experiments include several with such "analogues," as well as with pharmahuasca -- the pure ayahuasca alkaloids in "ayahuasca capsules." A thorough index, twenty-one footnotes, nine tables and a detailed bibliography of 418 sources make this a valuable reference book, as well as Ott's personal logbook of psychonautic "travels in the universe of the soul" with ayahuasca. I hope the simple home technology described in this book will drive the last nail into the coffin of the evil and hypocritical, fifteen-hundred-and-ninety-eight-year-old crusade to eliminate this class of drugs from the face of the Earth. May the Entheogenic Reformation prevail over the Pharmacratic Inquisition, leading to the spiritual rebirth of humankind at Our Lady Gaea's breasts, from which may ever copiously flow the amrta, the ambrosia, the ayahuasca of eternal life!